The Ontario Coalition Against Poverty (OCAP) is one of the best known anti-poverty organizations in Ontario. It has acquired a reputation for militant direct action tactics on such issues as affordable housing, welfare, homelessness, and immigrant and refugee rights. In a political climate where powerful politicians and vested interests wish the poor would just quietly die, OCAP has proven to be a vocal critic. In 1989 three Ontario cities, Windsor, Ottawa and Sudbury, held marches against poverty which converged in Toronto. After the marches it was decided to create a provincial body in order to try and raise the issue of poverty in the face of indifference from politicians. OCAP was the result. 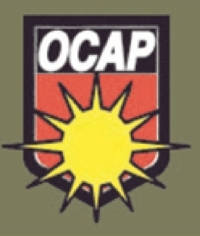 While OCAP does have organisational affiliates across the province, the group is based in Toronto. Where OCAP has really been successful is in drawing public attention to the issue of homelessness. In 1998 businesses in the downtown core near the Eaton Centre lobbied local councilor Kyle Rae to close a Salvation Army shelter because the homeless were ‘hurting' their business by panhandling. OCAP members took to the same businesses picketing them until they signed a letter calling for the shelter to be reopened. One businessman denied he had ever called for the closure of the shelter, even though he was widely known to be the architect of the closing. On August 7th 1999 OCAP activists, frustrated over the city's failure to address the problem of homelessness and the increased summer crack-down on squeegee kids and the homeless, erected a "Safe Park" at Allan Gardens, a downtown park in one of the city's poorest neighbourhoods. An estimated 500 people, among them members of community groups and trade unionists as well as the homeless, visited the park on Saturday evening and over 100 slept there. Despite threats from Toronto Mayor Mel Lastman that the poor would not be allowed to take over a public park and that they would be cleared out by the end of the weekend, as night fell Sunday evening, the Safe Park remained. In the last municipal election Lastman demonstrated his awareness of the problem of homelessness when, the same day as a homeless man was found dead in the washroom of a North York petrol station, he declared there were no homeless in North York. The end came early on August 11, the day after Lastman called OCAP organizer John Clarke a "thug" and described OCAP as "people paid to cause trouble. " Shortly before dawn the police moved in. People sleeping in the park were told they had fifteen minutes to leave or they would be arrested (strangely enough a local TV station, CITY TV was given two hours notice that the park was going to be cleared). The local media were smug in their denunciations. A columnist for the allegedly liberal Toronto Star sneered that Clarke was home in bed when the raid came and that he earned $20,000 a year. Much was made of the fact that only seven of the twenty -seven arrested at the park were actually homeless. That being arrested might have more serious consequences for the homeless, than for someone who has a home (is that now considered a privilege?) did not seem to occur to the media. The Police are generally not in the habit of granting bail to someone without a permanent address, so it is easier to get out of prison if you give a friend's address. While OCAP activists were in jail some were told by Police that Clarke lived in a mansion. Given the current Toronto housing market and Clarke's salary, he must be one of the smartest people in Toronto to have found such a bargain! Folk singer Phil Ochs' once quipped that a liberal is someone who is two steps to the left of centre on most issues and two steps to the right of centre when it affects them personally. Or when the poor and homeless try to do something for themselves rather than being passive victims for paternalistic liberals to assist. Yet it was not only the liberal and conservative media which criticised OCAP. Toronto's ‘alternative' weekly Now published several columns from editors (many of whom are former Trotskyists), who argued that OCAP was out of touch with the times and that Clarke "lacked the sense that resistance is an art [!]" Perhaps the prize goes to the International Socialists whose newspaper Socialist Worker printed two articles on the Safe Park, yet didn't mention OCAP. Surely it wouldn't have anything to do with the IS calling OCAP "racists" after a public dispute around International Women's Day 1998, would it? The Monday after the destruction of the safe park OCAP activists met to plan the next step. Over 60 activists attended the meeting which evaluated the Safe Park and discussed the media vilification of OCAP and Clarke in particular. Although the obvious question was what to do for an encore, wisely OCAP has decided not to try and re-occupy a park immediately, reasoning that the Police would be ready for such a contingency and would respond with repression. Instead OCAP has decided to "regularly and systematically disrupt the conspicuous money-makers that profit from the attempted ‘disappearing' of the homeless... until the Mayor and Council begin conducting themselves with some honour." Whether or not it is possible for the Mayor to act with honour is another question, but OCAP's very visible activism is unlikely to disappear. First published in Red and Black Notes in Autumn 1999, this article has been archived on libcom.org from the Red and Black Notes website.